You are not logged in. [Log In] Pond Boss » Forums » PHOTO GALLERY » Image Gallery » Cant seem to Identify what this is. Any thoughts? Cant seem to Identify what this is. Any thoughts? Found this floating in my main pond. It seems to stay mostly along the shore line. My run off pond, which feeds into my larger pond, is completely covered by it. Any thoughts? 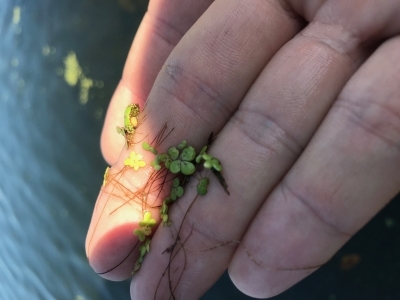 There's also a few watermeal plants in one photo; the seed-like specs that are clustered together in upper part of the sunlit ring finger. From my limited experience, the watermeal will assume dominance, depending on temperatures and the nutrient levels in the water. Adding to Kelly's comments: watermeal does not have a root dangling from it's leaves. Duckweed does. Watermeal is supposed to be a superfood, too. I might try using it as a mulch. Or in the compost heap.